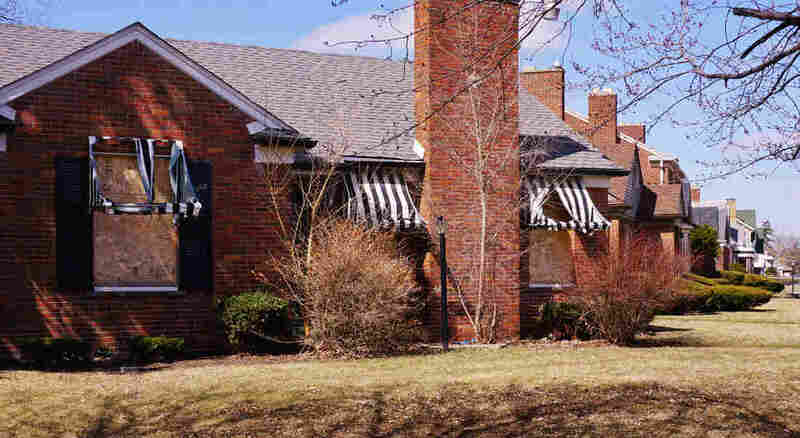 Mass Tax Foreclosure Threatens Detroit Homeowners Tuesday is the deadline to begin what many call the largest U.S. mass tax foreclosure. With the city counting on tax revenue, the owners behind on payments may be forced out of their homes. 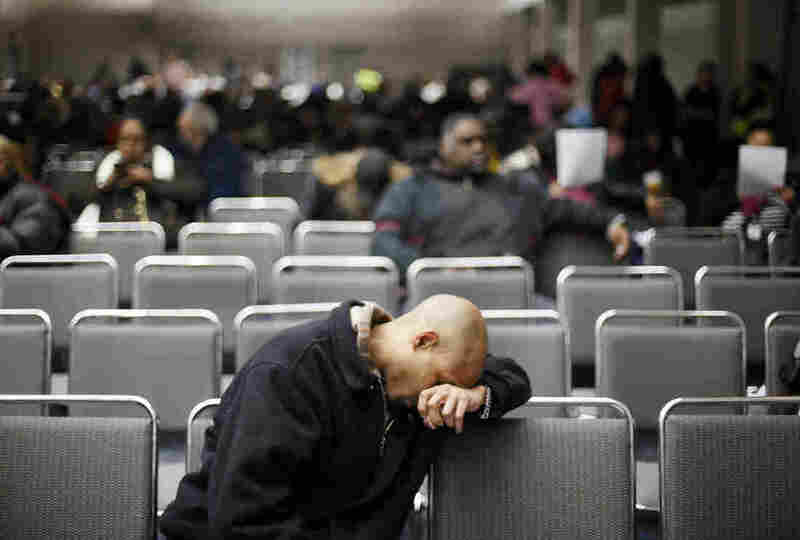 Homeowners sit in a conference room in Detroit's Cobo Center while waiting for their cases to be heard to avoid foreclosure from tax debts in Detroit on Jan. 29. This year, Wayne County officials sent out 62,000 foreclosure notices to city homeowners behind on property taxes. With Detroit's high unemployment and poverty rates, it's not hard for Leland to find residents facing foreclosure — or who know someone that is. County officials are foreclosing on tens of thousands of homes in Detroit along streets like this, on the city's west side. "It's scary," he says. "Seventy-two thousand in Wayne County, thousands of those here in the city of Detroit. This is a crisis. And you know — city, county — we don't want these properties ... we want people to stay in their homes. And this is gonna put people on the street." Leland supports a moratorium on foreclosures to give homeowners more time to pay taxes or have property values reassessed. Detroit resident Sandy Combs lives with her partner of two decades, Ken Brinkley, in a house he inherited from an aunt. She lost her job in 2006 while Brinkley had triple bypass heart surgery. Combs says they paid medical bills instead of taxes, were foreclosed on and their house sold at auction. They then started paying rent to live there and tried to scrape together enough money to buy it outright. But they discovered that property taxes had not been paid and the house went up for auction again — this time to a company that wants to evict them. "It's gonna kill Kenny. He's 82, this house is all he has. He knows he's on his way out. How can these people be so crazy? 'Cause it's not our fault," Combs says. It's not uncommon for speculators to buy up properties and jack up rents. Wayne State University professor John Mogk says speculators have been gobbling up Detroit for decades, gambling that new development will dramatically increase property values. "What's unique in Detroit is the scale of the problem," Mogk says. He says other investors buy deteriorating buildings for as little as $500 apiece and then rent them as is. "And so a great many of these properties are being purchased by what previously we would call slumlords," he adds. "And they're being rented without being brought up to the city code, and milked, and eventually they may stop paying taxes. And as the homes become uninhabitable they will again revert to the city." It's a desperate cycle that Detroit officials are struggling to break. City officials say they don't want to be landlords — they just want the badly needed tax revenue. Every time a speculator buys a property and lets it sit vacant, it becomes a magnet for blight. That does nothing to improve the city's long-term tax base — that's done by homeowners. And it remains to be seen just how many of the thousands facing imminent foreclosure will be able to make payment arrangements so that they can be the ones to provide that tax revenue.